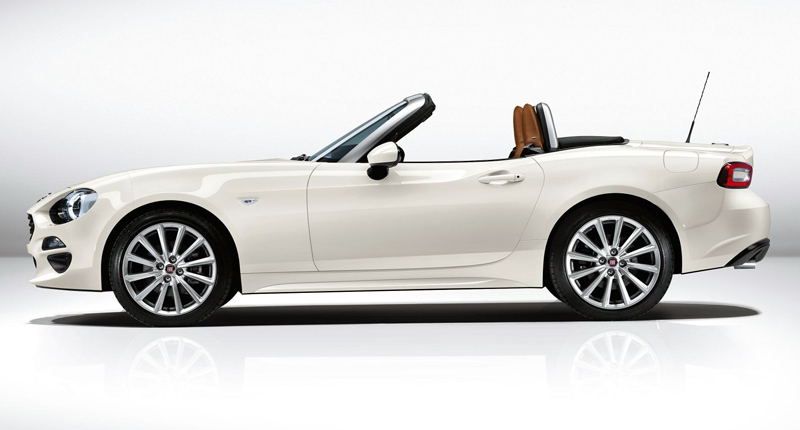 The 2017 Fiat 124 Spider draws its roadster inspiration from two distinct sources. The first, of course, is the most obvious. The revival of the nameplate takes us back to the original Pininfarina-designed Fiat 124 Sport Spider 2+2 convertible sports-car, which the Italian brand built from as early as 1966. Nearly 200 000 units were sold over a lengthy production run, making it a tremendously popular offering, particularly in the United States. Fitting, then, that the new model — which doffs its cap at the original with a handful of smart styling cues — was unveiled at the 2015 Los Angeles Auto Show. And the second automotive muse? Well, that’s none other than the fourth generation of the world’s best-selling two-seater convertible. 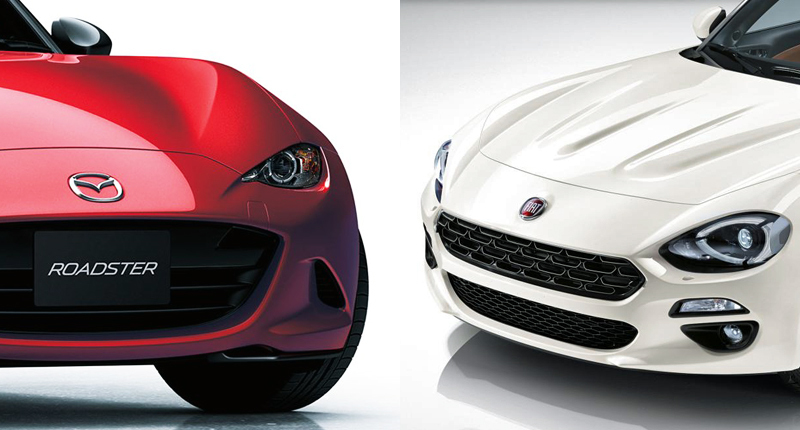 Yes, the upcoming Fiat 124 Spider (pictured right) is unashamedly based upon the latest Mazda MX-5 (aka Miata) (pictured left). Thanks to a joint venture between the two automakers, the little Fiat pilfers the Mazda’s nifty rear-wheel drive platform. And it sure could do worse. 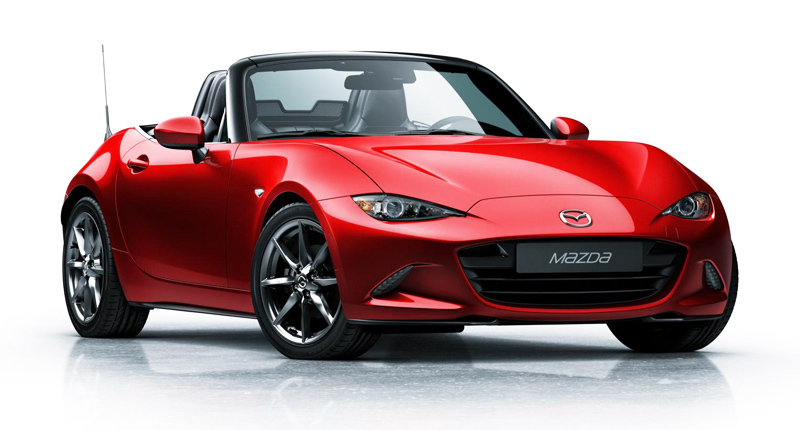 The 124 Spider will be built at Mazda’s Hiroshima factory in Japan, although the engine lurking beneath its bonnet will, of course, be bolted together back home in Italy. Interestingly, the original plan (which dates back to early 2012 at least) from the folks at Fiat Chrysler Automobiles was for a new Alfa Romeo Spider body to be plonked over the MX-5’s greasy bits. But Alfa instead focused its attention (and cash) on developing the new Giulia, saying that it wanted its products to remain 100 percent Italian. So, the Fiat 124 Spider was born. And although it obviously shares the Mazda’s lightweight, rear-drive philosophy, there are a few clear differences between these unlikely automotive siblings. The most conspicuous, of course, is in terms of styling. Although their proportions are certainly similar — and their wheelbases identical — the Fiat’s body-shell actually makes it a dash longer, wider and taller than the Mazda. And, boy, does it look different. While the latest MX-5 is a study of unfussy design, the 124 Spider features all manner of intricate styling elements, from the pair of retro bulges sculpted into the bonnet to the elaborate (by comparison, anyway) lighting components up front. However, the two dashboards – and accompanying switchgear – appear to be virtually identical (although there are differences when it comes to other cabin items, such as the steering wheel and seats). The entry-level MX-5 comes fitted with a free-revving 1.5-litre naturally aspirated petrol mill, which provides the rear wheels with 96kW and 150Nm. It doesn’t sound like very much, but it’s bang in line with the lightweight roadster’s back-to-basics ethos. The second engine option is a somewhat perkier 2.0-litre four-pot, which bumps peak output to 118kW and 200Nm, and cuts a full second off the base model’s 8.3-second sprint-to-100km/h time. Both units can be linked to either a six-speed manual gearbox or six-speed automatic transmission. 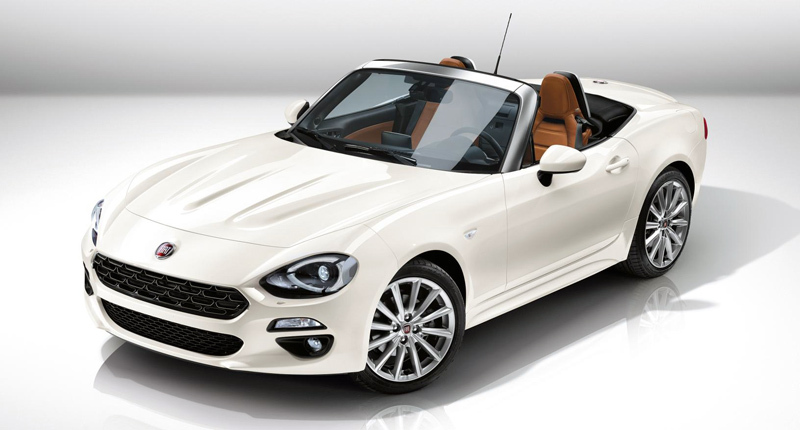 The Fiat 124 Spider, meanwhile, will bring the no-longer-dark art of turbocharging to the table. Yes, a 1.4-litre MultiAir four-cylinder mill – as used in various other Fiat and Alfa products — will provide the 124 with an entirely different flavour of power. In Europe, this downsized turbo engine will churn out 104kW and 240Nm, placing it handily between the two MX-5 derivatives in terms of power, but giving it a significant edge over both in the torque department. But, for whatever reason, it seems the same mill will be tuned to deliver a slightly healthier 119kW and 249Nm for North America. Fiat, of course, has yet to reveal official performance figures. But we can say that the Italian roadster will likely be somewhat more tractable around town and perhaps a smidgen more economical, too. 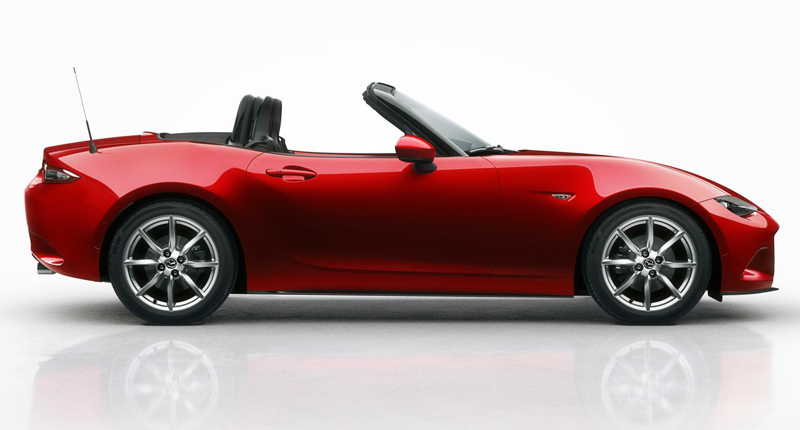 Although since the 124 Spider is a little heavier (and will likely use the same gearboxes as the Mazda), we don’t expect it to leave the MX-5 choking on its forced induction flavoured dust — not that these sorts of cars are all about straight-line speed. But, if the rumours are to be believed, that won’t stop the folks over at Abarth — Fiat Chrysler Automobiles’ tuning subsidiary — from having their way with the new 124 Spider. Indeed, early reports suggest that Abarth will massage the 124’s internals to deliver more than 150kW, before adding styling upgrades that pay homage to the Abarth 124 Stradale of the 1970s. So, Abarth model or not, there’s no doubt that the Fiat 124 Spider will deliver its power in an altogether different way to the somewhat more old-school powertrain found in the MX-5. And that, along with its more ornate design language, is what will ultimately set the 124 Spider apart from the platform-donating Mazda MX-5. Which you prefer will depend almost entirely on those two factors. Plus, of course, the value you place in each badge.